In the midterms this week, Democrats took control of the House of Representatives, picking up between 35-40 seats, in an election dubbed “The Year of the Woman.” A history making 100 plus women will head to the House next session, as Democrats celebrated their upcoming check on Trump for the first time since he took office. As the week ended, senate races in Florida and Arizona and governor races in Florida and Georgia were still undecided, as Trump and his allies stoked false claims of voter fraud and interference by Democrats. Americans did not get a chance to catch their breath, as the next day Trump took a major step towards ending the Mueller probe, forcing out Attorney General Jeff Sessions, and installing a crony who has been critical of the probe, and talked of starving it of funding to end it. Grassroots activists mobilized with protests nationwide to “Protect Mueller.” Post-election reporting indicated Trump is “depressed” ahead of possible indictments coming soon from the Mueller probe, including possibly of his son, Donald Jr. In Tallahassee, Florida, Scott Beierle, 40, shot and killed Nancy Van Vessem, 61, and Maura Binkley, 21, and injured five others at a hot yoga studio, before killing himself. Beierle had recorded numerous misogynistic and racist videos, and had been accused of touching women’s buttocks without their consent. He expressed his disgust at women online and urged ‘incels’ to fight back. In an extensive article, the New York Times Magazine reported on the rise of white nationalism, and how U.S. law enforcement failed to see the threat coming, and now do not know how to stop it. White nationalism is no longer on the fringes, but has entered the political mainstream. A report produced by the Brennan Center for Justice calls out the DOJ for its “blind spot” when it comes to domestic terrorism and hate crimes. On Saturday, at a campaign rally in Florida, Trump bragged about sending the U.S. military to the border, as troops began putting up chain-link fencing topped with barbed wire earlier in that day. Trump also said it’s “a little suspicious how those caravans are starting,” insinuating, without evidence, that the Democrats were behind it. WAPO reported Trump’s military deployment, along with National Guard forces at the U.S.-Mexico border since April, could cost $200 million by the end of the year. Trump has asked the military to slash next year’s budget. NYT reported that according to analysis of data, the Trump regime has sharply lowered financial penalties against banks and big companies accused of malfeasance, mirroring the regime’s deregulatory agenda. Under Trump there has been a 62% drop in penalties imposed by the S.E.C., and a 72% decline in corporate penalties from the Justice Department’s criminal prosecutions. On Sunday, without citing evidence, using his position as Georgia’s Secretary of State, Brian Kemp’s office announced the Democrats were under investigation for allegedly trying to hack the state’s voter registration files. Trump appeared with Kemp at a campaign rally, but neither made mention of the investigation. Late Sunday, a spokesperson for Kemp said a person named Rachel Small had allegedly talked about trying to hack Kemp. On Monday, NBC and Facebook said they would stop running a 30-second inflammatory ad by Trump’s political team that featured Luis Bracamontes, saying it was racist. Both had run the ad over the weekend. On Monday, HuffPost reported hundreds in armed militia groups are headed to U.S.- Mexico border following Trump stoking fear of the “caravans,” sparking concern from the U.S. military. On Monday, in a statement, Attorney General Jeff Sessions said the Justice Department plans to monitor voting and investigate voter fraud, without specifying what fraud-related issues the department will be looking for. In another tweet, Trump accused CNN of airing “Fake Suppression Polls” and engaging in“false rhetoric,” although he provided no evidence or explanation of what he was referring to. On Monday, the Des Moines Register reported DOJ personnel will be sent to a county in northwest Iowa, which has a large population of immigrants, to monitor the vote. On Monday, WAPO reported that members of Russia’s lower house of parliament will be in the U.S. to help certify the integrity of the midterms, ensuring that the vote lives up to international democratic standards. The news was first reported by Russia-state media outlet Tass, which said two member of parliament will be examining cybersecurity, gerrymandering, voting rights, and campaign financing in the U.S.
On Monday, Trump told reporters he “probably” will not be meeting with Vladimir Putin this weekend in Paris as scheduled, saying instead they will meet at the G20. On Monday, Vanity Fair reported Trump has been working to absolve himself of any blame if the GOP loses the House. Trump claims he has brought crowds and excitement, and it would be worse without him. A West Wing official who testified before the Senate Intelligence Committee said with Mueller likely reporting his findings shortly, that other than Trump, Roger Stone and Donald Jr.will face the most exposure. Concern is Mueller will be able to prove that Donald Jr. perjured himself to investigators when he said he did not tell Trump beforehand about the June 2016 Trump Tower meeting. On Monday, in an apparent last-minute pitch to women who polls show overwhelmingly support Democrats this election, Trump brought Ivanka, Kellyanne Conway, and press secretary Sarah Sanders to a rally in Indiana. On Monday, watchdog group CREW reported Ivanka’s fashion brand won first trial approval for 16 new trademarks from the Chinese government in October, the largest number in a single month since Trump took office. On Monday, Fox News host Sean Hannity, who said in a tweet that he would not appear on stage with Trump, campaigned on stage with him in Missouri the night before midterms. CNN Business reported Fox News staffers have anonymously expressed outrage over Hannity’s rally appearance, saying “a new line was crossed,” and “I am so f — -ing mad.” Hannity was supposed to interview Trump. On Tuesday, WSJ reported Taiwanese supplier Foxconn, which Trump has used as an example of bringing jobs to the U.S., is considering bringing Chinese workers to Wisconsin due to the tight U.S. labor market. A report by the Lexington Herald-Leader found that Kentucky has fewer coal jobs than when Trump took office, shrinking from 6,550 jobs in the first quarter of 2017, to 6,381 this past quarter. On Tuesday, Le Monde reported Dmitri Rybolovlev, the Russian oligarch who purchased a mansion from Trump in 2008, was detained in Monaco, and is under investigation for corruption and influence peddling. On Tuesday, voting irregularities were reported in several states. Several states extended voting hours including two precincts near Spelman and Morehouse College in Georgia, and Harris County in Texas. On Tuesday, in the midterm elections, Democrats took back control of the House, while Republicans kept control of the Senate. As of Saturday, Democrats had picked up 35 House seats, with more counts pending. In an election some dubbed as the “Year of the Woman,” for the first time in history, there will be more than 100 women in the House, including the first Muslim American (two) and Native American (two) women. A total of 34 new women won House seats, 33 of whom are Democrats, beating a previous high set in 1992, with close races still to be decided. Most of the women replaced incumbent men. They join 66 House women who were re-elected. There will be at least 100 women in the House next session, the largest number in U.S. history. The party gap is large: Democrats 87, Republicans 13, with races pending. Democrats also did well at the state level, flipping seven governorships, six state legislative chambers, and more than 300 state House and Senate seats. Democrats also added control of the trifecta — the legislative chambers and the governor’s office — in seven more states: Maine, Connecticut, Colorado, Illinois, Nevada, New Mexico, and New York. With Democrats having 26 senate seats in play to Republicans having just 8, Democrats won 8 of the 10 senate seats in swing states, with the final two, Arizona and Florida, still undecided by weeks end. WSJ reported following midterm success, and after another mass shooting in Thousand Oaks, California, the Democrats plan to pursue the most aggressive gun-control legislation in decades. In the midterms, Democrats beat at least 15 House Republicans with an “A” rating from the National Rifle Association, while the candidates elected to replace them all scored an “F” NRA rating. Trump insiders fear the White House is not set up to defend itself from the Democrat House onslaught. Trump reportedly is thinking what they could they release about him, and how does it work politically for him. Insiders also reportedly say Trump is “very depressed” about Donald Jr. possibly facing indictment. According to three sources, Donald Jr. has told friends he could be indicted as early as this week. Trump also said the Mueller probe is a “hoax,” and “a disgrace, it should have never been started because there was no crime,” saying the only reason he has not fired Mueller is because it might make him look bad. On Wednesday night, the White House revoked Acosta’s press credentials. Press secretary Sanders accused Acosta of “placing his hands on a young woman” who was trying to take the microphone as the rationale. On Thursday, reporters and new organizations of all political leanings slammed the White House for barring Acosta. The White House Correspondents’ Association also condemned the move. On Thursday, a CNN executive accused the White House of using a ‘doctored’ video to justify revoking Acosta’s press credentials. On Wednesday, at Trump’s request, Sessions resigned as attorney general. Sessions’s resignation letter reads, “Dear Mr. President, At your request, I am submitting my resignation.” The letter is not dated. WAPO reported Sessions received a call from Chief of Staff John Kelly on Wednesday morning telling him Trump wanted him to resign. Sessions wanted to finish the week, but Kelly said Wednesday would be his last day. A DOJ official said Whitaker would assume authority over the Mueller probe, and that his role will be subject to the normal review process for conflicts. Trump has told advisers that Whitaker is loyal and would not have recused himself in Sessions’ shoes. Rod Rosenstein went to the White House that afternoon for what an official said was a pre-scheduled meeting. Whitaker has said in the past the Mueller probe has gone too far, should be given a budget “so low that his investigation grinds to almost a halt,” and that the finances of the Trump family should not be under scrutiny. On Wednesday, Reps. Jerrold Nadler, Adam Schiff, and Elijah Cummings, along with Sen. Dianne Feinstein, sent letters to top White House officials demanding that they preserve records following the firing of Sessions. On Wednesday, Guardian reported Whitaker was paid to sit on the advisory board of World Patent Marketing, which was ordered in May to pay a $26 million settlement as part of a vast scam of aspiring inventors. Emails filed in federal court show from August 2015 Whitaker used his role as a former federal prosecutor in a threatening email to a customer of World Patent, who had complained to the Better Business Bureau. On Thursday, CNN reported Trump had already begun reviewing with his lawyers the written answers to questions from special counsel Robert Mueller when he fired Sessions. Roger Stone continues to be a focus. On Thursday, Mueller’s team is set to appear in court to defend its authority as another one of Stone’s former associates aims to quash a subpoena for grand jury testimony. As Mueller’s team begins to write its final report on the Russia probe, the White House is looking to hire as many as two dozen lawyers for the counsel’s office as Democrats take control of the House. On Thursday, George Conway and Neal Katyal, Obama’s former solicitor general, wrote in an op-ed that Trump’s appointment of an acting attorney general, bypassing the Senate, is unconstitutional and illegal. On Thursday, NYT reported in a 2014 interview, Whitaker said the courts “are supposed to be the inferior branch,” and criticized the Supreme Court’s power to review legislative and executive acts. On Thursday, CNN reported Whitaker has close personal ties to Sam Clovis, who has been interviewed in the Mueller probe. Whitaker was Clovis’ campaign chair in 2014 when he ran for state treasurer in Iowa. 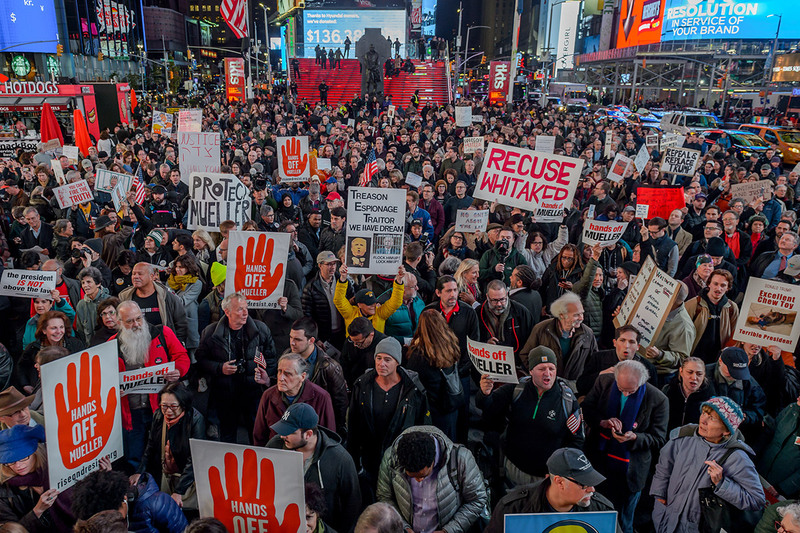 On Thursday, “Protect Mueller” demonstrators took to the streets in cities and towns across the country to protect the Mueller investigation, after the departure of Sessions and appointment of Whitaker. According to protest organizers, progressive groups were able to mobilize about 100,000 people at approximately 900 nationwide “rapid response” rallies just one day after Sessions’ resignation. On Friday, CNN reported that the backlash to the Whitaker appointment has caught the White House by surprise and raised concerns about his ability to remain in the post if he remains in the headlines. On Friday, speaking to reporters, Trump tried to distance himself from Whitaker, saying “I don’t know Matt Whitaker,” and “I didn’t speak to Matt Whitaker” about the federal probe into Russian election interference. On Friday, Vox reported Whitaker privately advised Trump last year on how the White House might be able to pressure the Justice Department to investigate the president’s political adversaries like Hillary Clinton. At the same time, Whitaker, as chief of staff to Sessions, was advising him and Rosenstein on how to counter Trump’s demands that the DOJ open an investigation into whether the FBI “infiltrated or surveilled” his campaign. In two days, Trump has aggressively attacked three Black women reporters: PBS’s Yamiche Alcindor, Phillip, and Ryan. In an op-ed Ryan wrote of Trump long track record of publicly insulting Black women. On Friday, the WAPO Editorial Board wrote that even as legal experts spar over whether his appointment without a Senate confirmation is constitutional, Whitaker is unfit for the job. On Wednesday, the Trump regime rolled out a rule that will exempt employers from providing insurance coverage for birth control if it conflicts with their religious or moral beliefs. The rule, which will take effect in 60 days, would roll back an Obama-era birth control rule which required employers must cover all forms of contraception under Obamacare. On Wednesday, Patrick Casey, head of the white nationalist group Identity Evropa, whose members marched in Charlottesville in 2017, posted a picture on Twitter of himself standing in front of the White House. In the tweet, Casey writes, “Evropa has landed at the White House!” The group’s motto, “You will not replace us,” echoes the “Jews will not replace us” chants of white supremacists in Charlottesville. On Thursday, lawyers for Christine Blasey Ford said she is continuing to receive death threats. Dr. Ford has had to move four times, and has been unable to return to her job as a professor at Palo Alto University. On Thursday, the San Francisco Court of Appeals ruled that the Trump regime must preserve the Deferred Action for Childhood Arrivals (DACA) program begun under Obama. The ruling rejected the regime’s claim that ending DACA was not reviewable by the courts. The regime took the unusual step of asking the Supreme Court to review the case before the appeals court had ruled. Trump is reportedly planning to deny asylum to migrants from Central America, whom he dubbed the caravans. The new rules draw upon the same authority he used to ban travel from Muslim countries in his Travel Ban. On Friday, in a setback for the Trump regime, a federal judge blocked construction on the 1,179-mile Keystone XL oil pipeline, saying the regime failed to follow established rules and procedures for decisions like these. The judge said the Trump regime failed to present a “reasoned explanation” for the move and “simply discarded” the effect that construction would have on climate change. On Friday, WAPO reported that in former First Lady Michelle Obama’s new memoir she says she will never forgive Trump for advancing the false birther claim about her husband, which endangered her family. Trump was also agitated that the Florida and Arizona senate races, which appeared to go Republican on election night, still had outstanding votes to be counted and were undecided. Trump appeared to be referencing a Fox News segment discussing a lawsuit by the Arizona GOP on Wednesday over the counting of mail-in ballots, which was later settled Friday, allowing the votes to be counted. On Friday, Sen. Marco Rubio, in a series of tweets, suggested “democrat lawyers are descending on #Florida” to steal the election. He also referenced Broward County. Trump thanked him in a tweet. On Friday, standing on the porch of the Governor’s Mansion for a press conference, Scott accused “unethical liberals” of plotting to steal a U.S. Senate seat from him. On Friday, Hannity said on his show, “This is a disgrace that they get to do this election in and election out,” adding “somebody needs to go to jail here, if this keeps happening.” Scott nodded along as Hannity spoke. On Saturday, the Florida secretary of state, Republican Ken Detzner, ordered recounts of the senate and governor races, an unprecedented review of two major races. On Friday, WSJ reported Federal prosecutors have gathered evidence of Trump’s central role in hush payoffs to Stormy Daniels and Karen McDougal, which violated campaign-finance laws. In August 2015, as a presidential candidate, Trump met with David Pecker, chief executive of AMI. Pecker offered to use the National Enquirer to buy the silence of women about their sexual encounters with Trump. The Journal found that Trump was involved in or briefed on nearly every step of the agreements. He directed deals in phone calls and meetings with Michael Cohen and others. Cohen, Pecker, and Trump no longer speak. Cohen, who Trump called “my attorney” in April 2018, pleaded guilty to campaign-finance violations. Federal prosecutors who investigated Cohen are now examining business dealings by the Trump Organization. Nine people have died, hundreds of homes have been destroyed, and hundreds of thousands have been evacuated in a spate of wildfires this week as a result of the Camp Fire in the area of Paradise, California. On Friday, Trump traveled to Paris for ceremonies to honor the military in World War I as part of Armistice Day. He was scheduled to attend the military parade, after his plans to hold one in Washington were scuttled. Macron has warned his fellow European nations that they can no longer rely on the U.S. to defend them. His latest remarks came after Trump decided to pull out of a key 1987 nuclear treaty with Russia. On Saturday, Trump canceled a visit to the U.S. military cemetery outside Paris at the site of a 1918 battle in which U.S. and French forces fended off German troops during World War I, due to rainy weather. The battle, in which more than 1,800 died, looms large in the history of the U.S. Marines Corps. Chief of staff John Kelly, a retired Marine Corps general, his wife, and Secretary of State Mike Pompeo will visit instead. Canadian Prime Minister Justin Trudeau, German Chancellor Angela Merkel, and French President Emmanuel Macron did attend ceremonies for their fallen at cemeteries outside Paris. On Saturday, Trump named seven who will receive a Presidential Medal of Freedom award. The group includes Miriam Adelson, wife of Sheldon Adelson, both of whom gave $56 million to GOP Super PACs this cycle. On Saturday, NYT reported that the 5,600 American troops who were rushed to U.S.-Mexico border by Trump have little electricity, will receive no combat pay, and face holidays away from home. Military morale is an issue. The deployment orders last through mid-December, meaning the troops will miss Thanksgiving, and have little to do beyond providing logistical support, unless Trump declares martial law.